A new paper by Willeit et al. 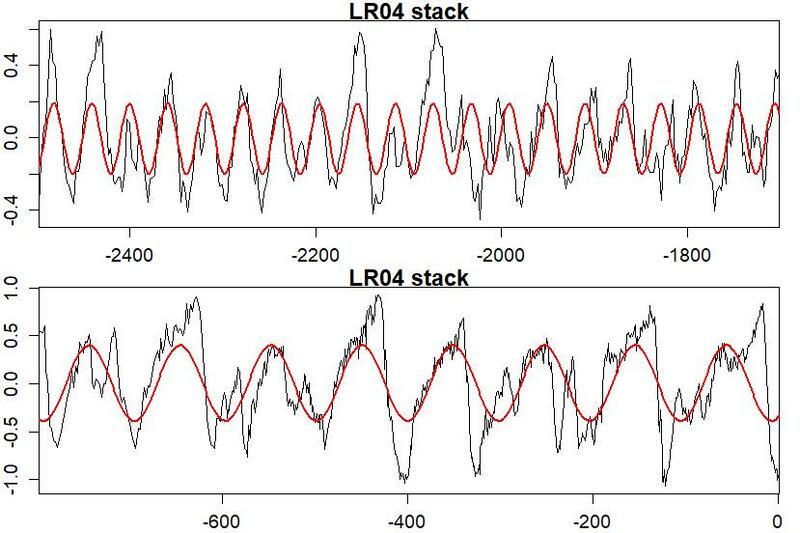 reports on the first successful model simulation of global climate over the last three million years. That’s a lot of years. 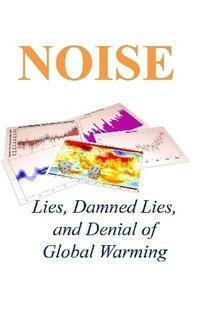 You can find out more, from the lead author himself, at the RealClimate blog. 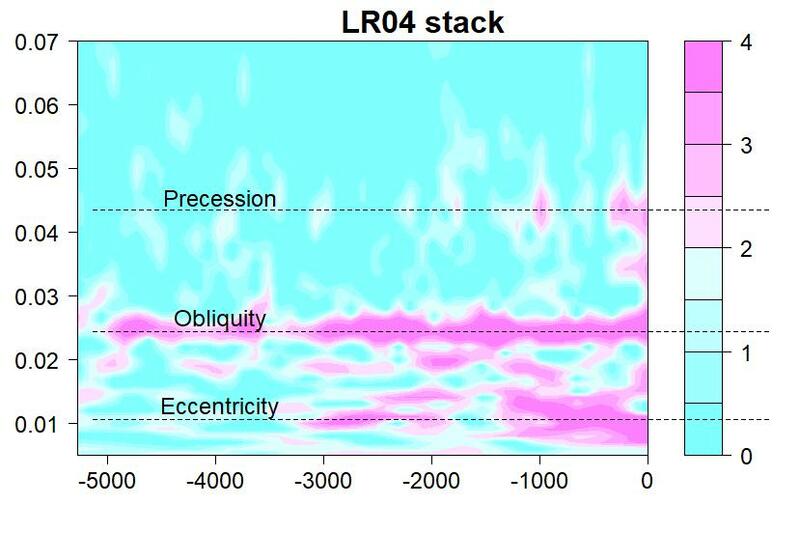 One of the real-world data sets they use, for comparison to their model results, covers an even longer time span: the LR04 stack, a stacked estimate of d18O (delta-oxygen-18) in sediment cores from around the world going back 5.3 million years. It’s a very good proxy for global ice volume; higher numbers mean more ice, lower numbers less ice. When I call the red line a long-term trend, I mean long; the smoothing time scale is about half a million years. It tells a story of long slow decline into icier and icier conditions, although we may have levelled off over the last million years. But there’s more to the data than the very-long-term trend. There’s all that wiggling around up and down, which it turns out isn’t just random. It shows structure, in fact it shows cyclic behavior, and although its cycles look fast on the 5-million-year time scale of the graph, they’re only “fast” by comparison; these cycles have periods of tens of thousands of years. I went looking for periodic/pseudoperiodic behavior with a wavelet transform. In the graph below, the x-axis is time (in thousands of years) to show how periodic behavior may have changed over time. The y-axis is frequency, the number of cycles per thousand years. The color indicates how active that frequency is at that time. I’ve also put in some dashed lines to mark frequencies that are of special interest because we find them in another set of data: the changing parameters of earth’s orbit. I’ve even labelled them, “Obliquity” for the cycle of how tilted earth’s axis is, “Precession” for the cycle of how that axis itself spins around the sky, and “Eccentricity” for (one of) the cycle(s) of how flattened earth’s orbit is. I’ll note that for the most recent segment, there is also some activity (not strong, but there) around frequencies from 0.042 to 0.044 cycles per thousand years (roughly 23,000-year cycles, like precession). The waxing and waning of these cycles mark the progress of geologic epochs over the past five million years. 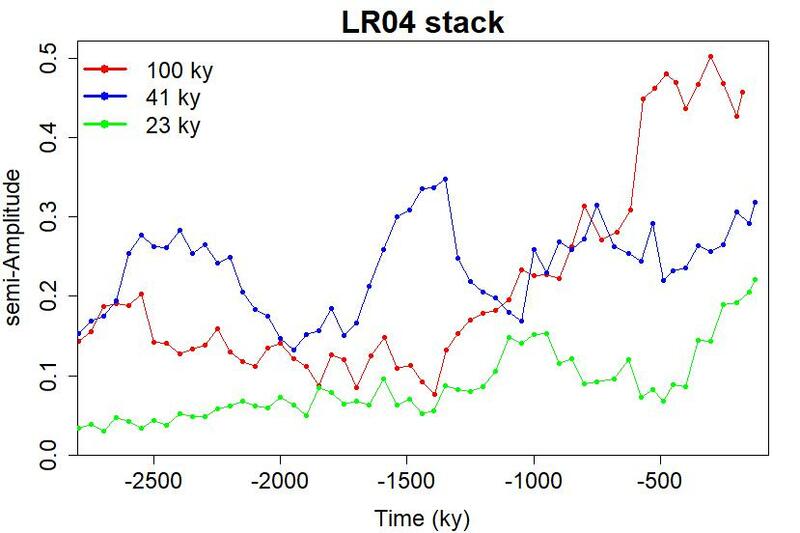 About 2.6 million years ago, the 41 kY cycle (obliquity) got stronger, and has remained so since (despite continuing to fluctuate in strength). This is the end of the pliocene epoch and the beginning of the pleistocene, which continued until a “mere” 12,000 years ago when the holocene epoch began. The 41 kY cycle dominated until about a million years ago, when the 100 kY cycle became its rival in strength. After about 600,000 years ago the 100 kY cycle has dominated. The transition is referred to as the “mid-pleistocene transition“. And that is one of the things the new paper has found. Their model successfully explains why the mid-pleistocene transition happened. For the best explanation of that, I refer you to the article at the RealClimate blog, or to the paper itself. Very fine! I particularly like the wavelet transform result. Sorry Tamino, this is not directly related to the paper you’re discussing here but the topic is somewhat related. 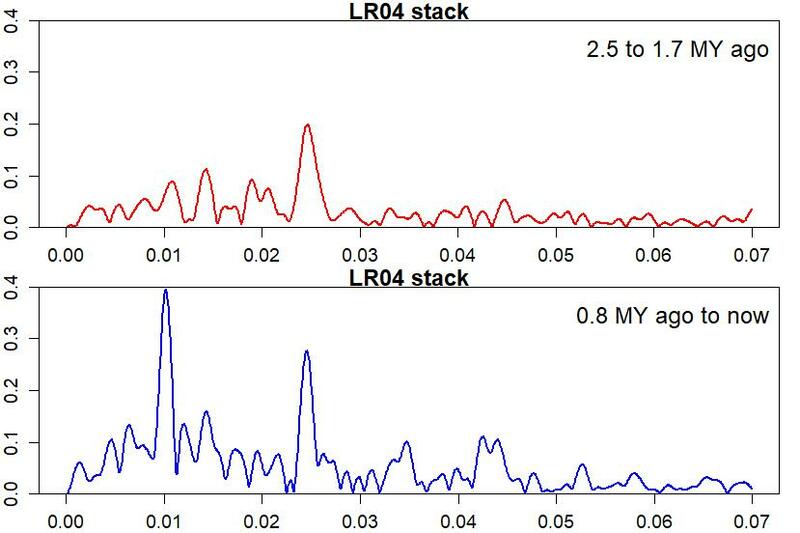 It’s a paper that studies the relationship between CO2 levels and temperature in the very distant past. A denier has directed me to it in CO2Science (I know, rubbish fossil fuel funded blog) which leaves me a bit confused because it’s been published in what sounds like a credible journal _ Climate. Title of the article in CO2 Science is “500 Million Years of Unrelatedness between Atmospheric CO2 and Temperature”. Davis, W.J. 2017. 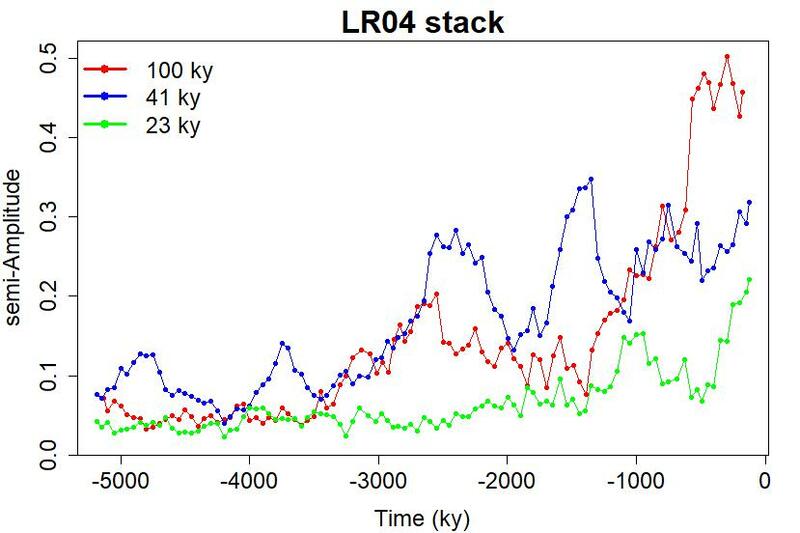 The relationship between atmospheric carbon dioxide concentration and global temperature for the last 425 million years. Climate 5: 76; doi: 10.3390/cli5040076. At Whatsup he is listed as “founding director” and “President and Chief Executive Officer” of a couple of institutes that Google doesn’t seem to have any information about. A sceptic might think that Davis, W.J. has no expertise in global warming and could perhaps be guilty of bigging up his qualifications. The journal “Climate” accepts papers “paid by authors or their institutions”. It claims that manuscripts are peer reviewed, stating “potential reviewers suggested by the authors may also be considered”. A sceptic might wonder about that too. As to the science of the paper, Skepticalscience.com has a good article. 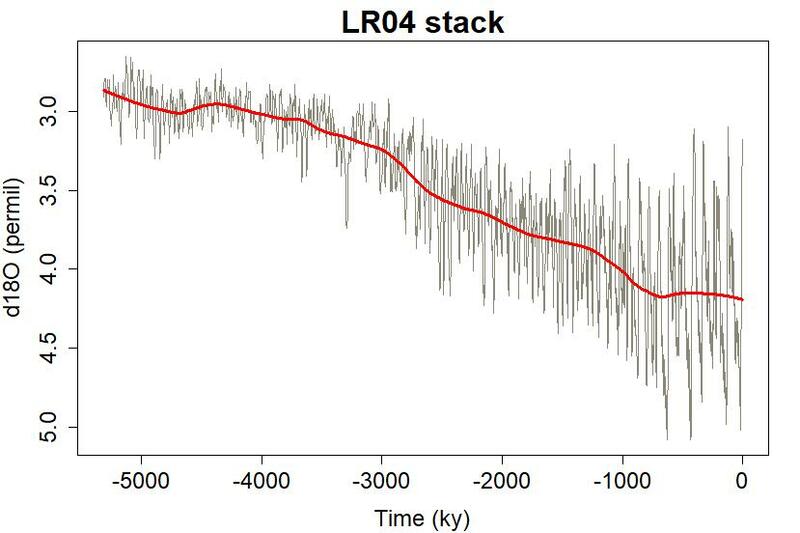 Basically the sun was weaker that far back in geological history, so relatively high levels of CO2 might not have been enough to prevent a glacial period- and a cold earth. Temperature apparently correlates well with CO2 *and* solar output. At least according to climate scientists rather than a sports scientist. I’m a little concerned that the irrational thinking gambit is beginning to affect environmental progressives more than one might expect given a base rate of irrational thinking. It might be affecting some climate scientists, too. First, sure, climate scientists are people and, often, as Dr Neil deGrasse Tyson observes, many famous scientists have big egos. They like to demonstrate they have a deeper knowledge than a peer, at least some of the time. So, in general, Professor Michael Mann is less concerned about pace of change than Professor James Hansen seems to be. I’ve recently seen this in an old review Mann did of the precursor to the book Uninhabitable Earth by David Wallace-Wells which appeared (I believe) in New York Magazine. Mann claimed Wallace-Wells cherry-picked scientific papers on the exaggeration side and was claiming things were worse than they are. Mann even made comparisons of Wallace-Wells with Guy McPherson, who clearly is out there (“I can’t imagine there will be a human being alive in 2030”) . I’ve read the article, and am reading Wallace-Wells’ book. And, while I disagree with Wallace-Wells in places, and agree with him and, as he’s stated on interviews, Uninhabitable Earth is a bit much for a title, I think Mann was unfair to claim this of Wallace-Wells. But, curiously, another thing Mann cited in that verbal review was that “Carbon emissions had plateaued” and, while this wasn’t sufficient, he said, he indicated it was progress. What Mann was doing is fundamentally bad science and statistics: He was extrapolating a curve. That extrapolation has now been falsified, so Mann was cherry-picking as well, on the optimistic side. The trouble is, the public isn’t this disciplined, and when I look at the supposed evidence backing up, for example, plastic bag bans, it is appalling. Yet everyone there thinks it is okay to argue that way. WHOI is studying microplastics and the key people feel that it is way too soon to claim huge harms. For one thing the mass balance of plastics in oceans doesn’t work out, so something is happening to it, something we don’t know. So to claim all the plastic we’ve put there is still there is premature. It’s a nit, but, also, plastic bags in oceans are the least of the plastic problems. Speaking of ice Javier is giving you a mention as “desperate scaremongers like Tamino” over at WTF.